Dental implants have an extremely high success rate, as long as certain parameters are followed. At Bradshaw Family Dental, we use 3D cone beam technology to eliminate any variables which can cause a dental implant to fail. With our cone beam technology, we are able to visualize exactly where the implant will be placed in your jaw. This ensures that there is adequate height, width, and density of bone, as well as adequate space between the implant and any other anatomical structures. We are then able to fabricate a guide which ensures that the implant goes exactly where we want it to. 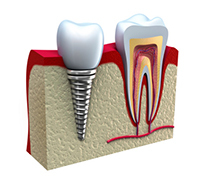 This eliminates many of the risks associated with dental implant surgery and allows for the most predictable result. At Bradshaw Family Dental, you can rest assured that all available technology and information is used in the planning, treatment, and restoration of your dental implant. If you have any questions, or if you'd like to schedule an appointment, please give us a call at (928) 277-0076.